All slaughterhouses in England will be forced to install CCTV under Government plans to crackdown on cruelty amid concerns about the mistreatment of animals at some halal abattoirs. Michael Gove, the Environment Secretary, has proposed that CCTV will be required in all areas where live animals are present with official vets given unrestricted access to the footage. It comes after charities and Tory MPs raised concerns about the treatment of animals in halal abattoirs after secret filming showed workers hacking and sawing at sheeps’ throats with firms facing allegations of animal cruelty. Such footage reignited the debate over whether animals should be stunned before they are killed for meat. British law prohibits the slaughtering of animals unless they have been stunned, but there are exemptions for Jewish and Muslim producers. 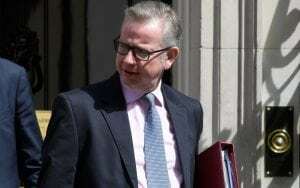 Michael Gove hopes the plan will play down fears that Brexit will lead to a watering-down of British food standards with the arrival of products like US-style chlorine-washed chicken. “We have some of the highest animal welfare standards in the world and the actions I am setting out today will reinforce our status as a global leader,” he said. British Veterinary Association President Gudrun Ravetz added: “Mandatory CCTV in all areas of slaughterhouses will provide an essential tool in fostering a culture of compassion that could help safeguard animal welfare. This is step in the right direction and should have happened years ago.